The company is founded in the year 1913 by its founder Thomas E. Wilson. As the company says about itself, no other company in the world has been so influential and deeply involved in shaping the games such as American football, baseball, tennis and golf, as Wilson has been. As the creator of significant technologies, Wilson has earned a world wide legitimacy in each sport it participates in and has produced legendary classics. Indisputably Wilson is the true American icon in the sports equipment world. Wilson is the leader of ball sports equipment manufacturers. The main sports, on which Wilson concentrates, are tennis, badminton, squash, golf, softball, basketball, baseball and American football. The Wilson business can be structured into three spheres – racquet sports, team sports and golf. This knee pad can be used in sports and other physical activities, where the knee protection and support is needed. It protects and supports the knee to prevent different knees injuries, for example, bruises and abrasions. It is understandable, that these injuries are much more widespread in sports, for example, in volleyball, where sportsmen are constantly diving and digging, but even prolonged work on knees can cause inflammation of meniscus, fatigue of cartilage and other knee problems, which result in permanent discomfort or even pain. This knee pad has a cushioning, that improves its wearers comfort, and a thick, high-density contoured foam, which improves knee protection against impacts of different intensity. Considering, that this pad is sleeve type knee pad, it is easy to get on and off. As mentioned before, this knee pad is sleeve type pad. Both of its ends are sewn. This pad has a classic design, therefore it is available only in black color and it has no special features in its appearance. It has a white Wilson logo on top. This knee pad has only two sizes – small/medium and medium/large, therefore it is a gamble, whether this knee pad will be suitable for you or will not. 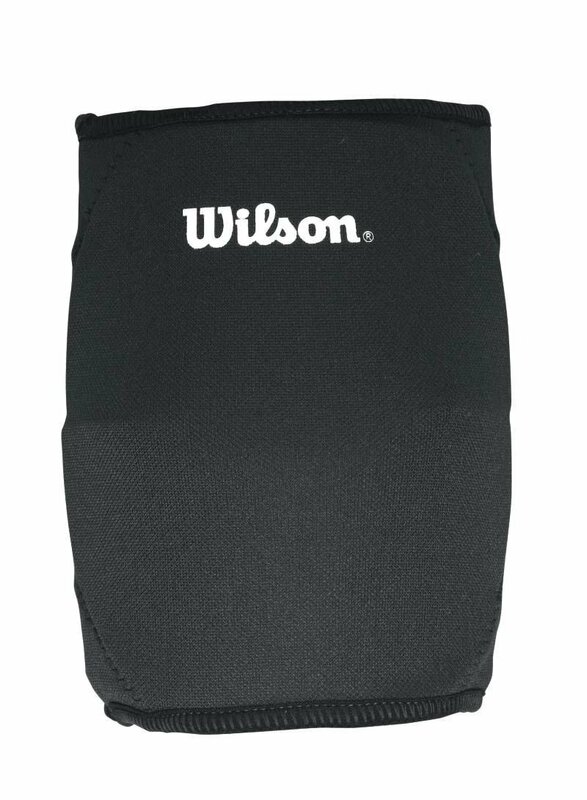 This Wilson Contoured Knee Pad is sleeve type pad, which is intended for knee protection and support during sports or other physical activities to prevent different knees injuries. As this pad is made of polyester, nylon, spandex and rubber blend, it can be washed in washing machine. Its size is 7” x 10” x 2”, but its weight is 1.0 pound. It is available in black color and it can be used by both adults and youngsters. Excluding cushioning and contoured foam, it has no special features. Usually this Wilson knee pad is sold in pairs.